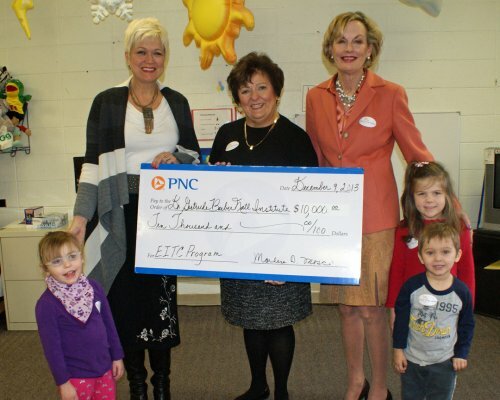 PNC Bank recently donated $10,000 to fund scholarships for preschool students through the Educational Improvement Tax Credit Program. The program, administered locally by the Barber National Institute, makes scholarships available to qualifying families to help defray the cost of preschool. Thank you to PNC Bank for their generous donation. Students in the Penn State Behrend Management Class organized a fundraiser during their 2013 Fall semester to raise money for the Barber National Institute. Zachary Colbert (pictured, right) and his classmates Conor Chadwick and Alexandra Sanders raised $501 in support of the children, adults and families who turn to our special organization every day for hope and opportunity. Zachary presented his team's contribution to Gary Bukowski, CFRE, vice president for Advancement at the Barber National Institute. We greatly appreciate the generous efforts of these three students and Penn State Behrend's continued support of the Barber National Institute!